In order to see your screen with bigger letters, please press simutalneously on "CTRL" et "+". To have again a standard screen, please press simutalneously on "CTRL" et "0" (zero). You need services for persons of reduced mobility or specially equipped infrastuctures ? To better welcome disabled people, the Chamonix Tourist Office has adapted its equipment, trained its staff and created special brochures. 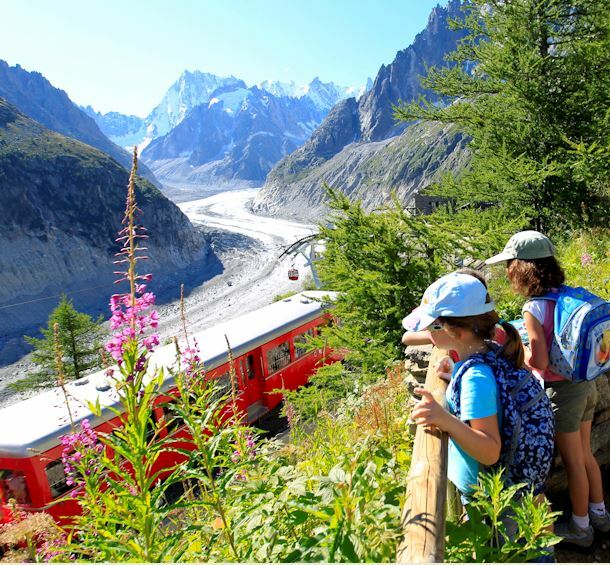 First alpine tourist office to obtain the official seal of approval for disabled tourism. This label covers motricity, visual, auditive and mental handicaps. o Main entrances are level with the street. o Two pay car parks located 200m away from the Tourist Office have places for people with reduced mobility. - The underground pay car park Saint-Michel has places for people with reduced mobility on the 1st, 3rd and 5th floors. To reach the Tourist Office from this car park, please go on the bridge located in front of the car park, then go down on the access ramp on the left side of the church and continue straight away in front of the Mountain House (Maison de la Montagne) until a second access ramp which will directly lead you in front of the Tourist Office. o Low brochure racks and counters, wheelchair accessible. o Improved washroom facilities, wheelchair accessible. o A wheelchair available on-site for disabled, reduced mobility (or sick) people. o Improved outdoor signage with deeper contrast and simplified pictograms. o A braille printed booklet is available at the welcome desk. o Extended use of pictograms inside the Tourist Office to indicate the main activities and attractions: hiking, museums, events... These signs are important for people who encounter difficulties in understanding written texts. o Automatic doors showing bicolored signs at 70 and 170cm. o Audio-T system : this system improves the quality and confidentiality of the exchanges between the information counsellor and guest. The information counsellor speaks into a microphone and his/her voice is transmitted directly to the hearing impaired person, either through a receiver-amplifier or by magnetic loop if the user has a compatible hearing aid.